The official journal of the Australasian Society for Ultrasound in Medicine, Australasian Journal of Ultrasound in Medicine sets international standards of practice for the Asia-Pacific region and beyond. The purpose of AJUM is to advance the discipline of diagnostic and therapeutic medical ultrasound to support the highest possible standards of patient care. 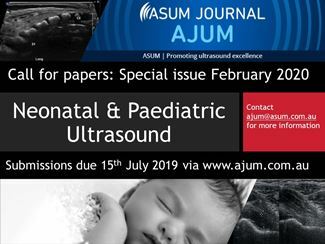 AJUM aims to be the leading journal covering the best practical applications of ultrasound in clinical practice. Educational, instructive and informative, AJUM is relevant to any field of medicine using medical ultrasound. AJUM publishes peer-reviewed, cutting-edge articles on current issues in medical ultrasound, encompassing all medical and allied health disciplines. AJUM also considers innovative articles incorporating imaging modalities which complement ultrasound diagnosis and therapies. Originally published as the Ultrasound Bulletin since February 1998, the journal was renamed to the Australasian Journal of Ultrasound in Medicine (AJUM) in February 2009. AJUM is published by Wiley and can be accessed online via the Wiley Online Library. Authors must refer to the Author Guidelines prior to submission. Access to all issues from 2009 is available via the AJUM Website. For information regarding submission of articles to AJUM, please see the AJUM Author Guidelines. To submit an article to AJUM, please click here.